On December 22, 2012 you can wear one of these funny "I Survived 2012 T Shirts" but, according to Ralph Waldo Emerson's meaning of doomsday, it is every day. Do you agree with him? What is the real meaning of doomsday? In modern times the word has come to be associated with Armageddon, the apocalypse, and the end of the world as we know it, and clearly has religious overtones. What Ralph Waldo Emerson may have been thinking of was an association with the Biblical idea of judgment day. But if so, it is still a strange thing that he seems to cast it in a positive light, as a good thing that should be looked forward to. Essentially he equates the idea of doomsday with the best day of the year, and the only day that matters, and the present one. How could that be? Maybe he was ahead of his time and knew a lot more about life, the universe, and everything than we imagine. This little quote (on the right) from the Transcendental philosopher makes doomsday over from something obviously public and worldwide, to another thing entirely – a private event, experienced by one person in the sanctity of his own heart, mind and soul. What could the intent of such an approach be? Can an individual experience the end of the world internally? Maybe we should replace it in his quotation with “12/21/2012” and see if it makes sense. If the idea of the world ending in late 2012 appeals to some, perhaps it can be taken by them as a metaphor and internalized after the date passes and nothing has happened. If we can take the idea of an external end, of an accounting or a judgment, of a reboot of the world, inside and make it a way to revitalize ourselves, then the crisis of 2012 can become an event that we relive every day and use as motivation for growth and change. So this is the way we view the state of ourselves and the world after December 21, 2012 has passed. We think of it as a time for transformation, as a time for change, as a time for focusing on what is real and important, in our daily lives. The old Zen and Taoist masters talked about making everyday events into extraordinary experiences – chopping wood and carrying water were paths to enlightenment. And so it is with the perceived, expected, but ultimately disappointing end of the world – it can be the end of everything that was unimportant, that was trivial, that was materialistic, that was holding you down by attachment. It can be the time for a new beginning, for a fresh start, for a second chance at a life you've always dreamed of living. But it's up to you to take advantage of this once in a lifetime chance to turn over a new leaf. And it's entirely possible for this to happen – you can do it. You can survive the crisis of 2012 by making it a personal, private doomsday, and making every day a chance for redemption and renewal. Ralph Waldo knew what he was talking about. 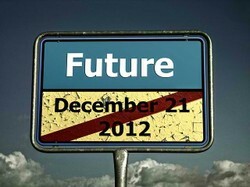 We did an article earlier in the year on "is the end of the world coming in 2012?" Be sure to take a look! Only To Be Worn If Mayans Were Wrong, Of Course! Do You Think The World Could End In The Next 100 Years? What Do You Think About Emerson's Doomsday Definition?